Remain that which I am. And personification of all virtue. Socrates also has the unusual privilege of being one of the few figures in history, flawed and human as he was, to be often likened to or mentioned in the same context as Jesus. Percy Bysshe Shelley refers to Socrates as the Jesus Christ of Greece and John Keats, in writing on the heroic spirit, wrote "I can remember but two - Jesus and Socrates." Benjamin Franklin, who famously compiled a list of virtues to aspire to, wrote, "Imitate Jesus and Socrates," for the virtue of humility. Socrates didn't write anything himself so to get a completely accurate and definitive handle on him and his methods is difficult - even his contemporaries disagreed and argued on who he truly was. But despite this impossibility to neatly pin him down, the legacy of his powerful personality and unique mind remains mysteriously far-reaching to this day. "Beware the barrenness of a busy life." "And as for me, all I know is that I know nothing." What is known for certain is that he mixed with people at all levels of society - high class, low class, educated, uneducated, male, female, military, civil, slave, and free - and engaged with anyone in the process of inquiry. Anyone was worthy of a sincere search for the truth which he was careful to distinguish from mere accumulation of knowledge. And he tended to humiliate the self-satisfied and self-congratulating experts and intelligentsia of Greek society which eventually helped get him into serious trouble with the state. (He was ultimately executed for "corrupting the minds of the youth of Athens" and "not believing in the gods of the state.") 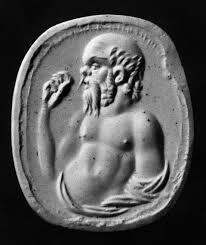 An oracle proclaimed that Socrates was the wisest of all men. Socrates clarified that he was wiser than all men only because he professed ignorance, while others claimed to have knowledge. Perhaps this is best put in his words: "but the truth is, O men of Athens, that God only is wise; and in this oracle he means to say that the wisdom of men is little or nothing." "I would trade all of my technology for an afternoon with Socrates."